A brutal PIT BULL attack that left a Waverly Hall woman disfigured and her Siberian Husky dead has drawn a rising tide of outrage. Residents say they long have complained about the loose pit bulls, but Talbot County authorities failed to act. The victim is 70-year-old Nellie Ralat, an artist whose works include pottery she fashions at Columbus’ Britt David Cultural Arts Studio. She’s now at Grady Memorial Hospital in Atlanta undergoing reconstructive surgery. Her recovery will take months. Her dog, Maggie, got emergency surgery neighbors paid for, and lingered two days before dying in vet care. RALAT'S INJURIES WERE SHOCKING: "HER FACE BASICALLY LOOKS LIKE A JIGSAW PUZZLE WHERE THEY SEWED HER UP," SAID JIMMY DYKES. ABOUT HALF HER SCALP WAS TORN LOOSE, HER LEFT EAR WAS GONE AND SO WAS MOST OF HER RIGHT. 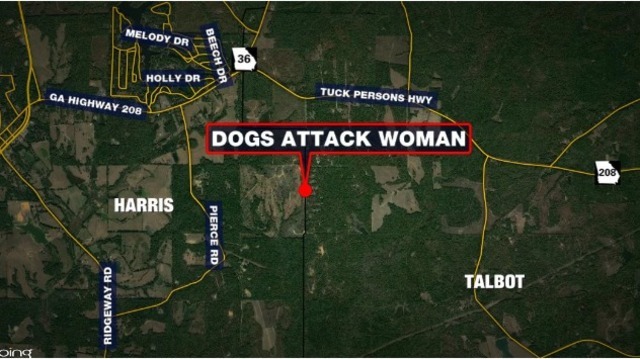 (WRBL NEWS 3) - A Talbot County woman is hospitalized in unsatisfactory condition and her dog was killed after being mauled by MULTIPLE PIT BULLS over the Thanksgiving weekend. The attack occurred early Friday afternoon along Baker Road off Georgia 208, said neighbor Lillie Best, who lives in that area of Talbot County not far from Waverly Hall. Best asked that the victim's name be withheld at this time. A Talbot County Sheriff's Office employee told News 3 that the attack was under investigation. The county's Animal Control office is also investigating. No reports were available on Monday. Talbot County Sheriff Bobby Gates did not immediately return a phone call. Multiple pit bulls owned by a resident on Baker Road attacked the woman and her dog, Best said. The injured woman was found by deer hunters and the dogs had to be pulled off of her, Best said. The owner of the dogs could not be reached for comment. The victim's Husky died over the weekend from injuries suffered in the attack. The victim has been in a Columbus hospital since the attack. Best filed a report with the Talbot County Sheriff's Office in May complaining about the dogs being on her property, she said. More and more pit bull attacks, and our legislators don't care. I'm guessing they're either nutters, or dog fighters themselves. How else do you explain the utter lack of concern for average citizens? Pit bulls have more rights than we do.